A UK type 5 reel game, with a £1 stake and £100 Jackpot. 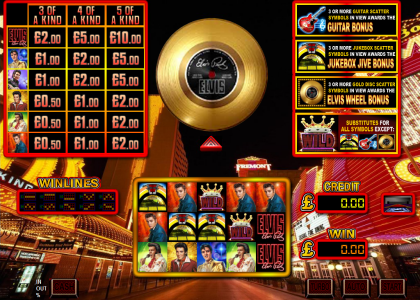 £100 gold disc wins and full screen of "elvis" symbols give Jackpot repeater! Other features include, jukebox bonus and guitar bonus. Any three or more matching scattered symbols starts relevant bonus. With a £100 Jackpot and four different ways to win it there's always a little more action on this game. The volatility of this game is considered low. Once payment has been made please request your game code via email to activate your game fully. Game updates and codes are sent out as soon as possible.